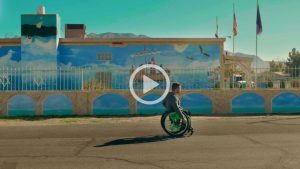 In the Church video “Wheelz: Overcoming is Possible,” a young man born with Spina Bifida shows that overcoming challenges is possible when you have faith, hope, and the Atonement of Jesus Christ. Aaron “Wheelz” Fotheringham is a member of The Church of Jesus Christ of Latter-day Saints—commonly referred to as a Mormon or Latter-day Saint. He’s also an elite wheelchair motocross (WXMC) athlete and has performed some of the riskiest world record–setting wheelchair stunts. He was born with Spina Bifida and was in a wheelchair by the time he was 8 years old. That’s when he started to develop his wheelchair skills at a local skate park and he’s never looked back. At 18, Aaron “Wheelz” found himself touring the world with elite action sports athletes. Those long tours took him away from his weekly Church meetings. In time, with all his trick progressions, he noticed some spiritual regression. After struggling with wondering if he’d ever feel happiness in the gospel again, Aaron turned to the Savior, Jesus Christ. Once he realized that Christ was always there to save him and that he just needed to turn to Him, Christ’s redeeming joy filled his life again. Aaron “Wheelz” believes anyone can overcome challenges when one has faith, hope and the Atonement of Jesus Christ.